Cut the potatoes into 1/3-inch-thick steak fries and transfer to a bowl of cold water. Bring a large pot of salted water to a boil. Drain the potatoes, add them to the pot and boil just until tender, about 5 minutes. Carefully drain the potatoes and transfer them to a paper towel–lined rack to cool. Refrigerate until chilled, about 1 hour. In a large, deep skillet, heat 2 inches of oil to 250°. Set a rack over a baking sheet. Working in batches, fry the potatoes just until they begin to brown around the edges, about 8 minutes. Transfer the potatoes to the rack and let cool. When all of the potatoes have been fried once, heat the oil to 350°. Fry the potatoes again, in batches, until golden and crisp, about 7 minutes per batch. 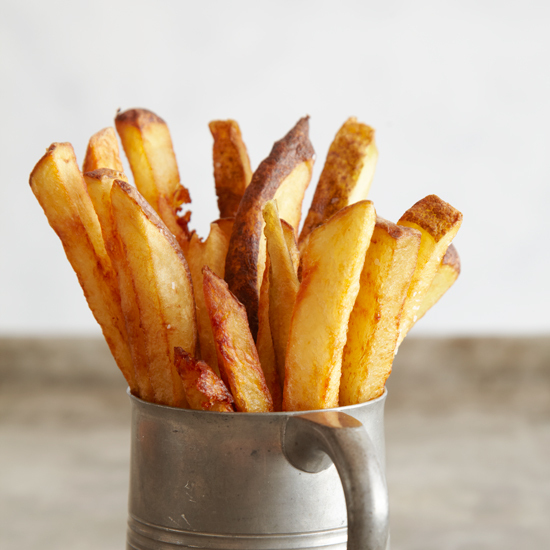 Drain the fries on a paper towel–lined baking sheet, sprinkle with salt and serve. Review Body: These are intensely time consuming, but the end product was worth the time and work. I didn't freeze them an hour every time, yet the fries were still wonderfully crisp. I fried them on medium, and then high for the second fry. I tossed them in cayenne and powder chicken base, yeah weird I know. Don't knock it til you try it! If you have a sack of potatoes you need to use, try this recipe out. Review Body: Over an hour to make french fries? I think I will pass.